Beginner Sport Kite flyers need one thing and one thing only - an enjoyable experience. Premier delivers a variety of entry level Dual-Line Sport Kites that offer the joy of flying in abundance. Both attractive and durable, Premier Sport Kites look great and fly great time after time after time. 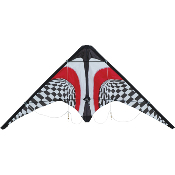 The Zoomer is built to offer the stable feel of a big kite with a small kite price. Framed with durable Solid Fiberglass, the Zoomer can not only handle novice punishment, but graces the wind like it's larger brethren. Its design allows it to be a little slower and stable so that lighting fast reflexes are not a prerequisite to enjoy your first flight.